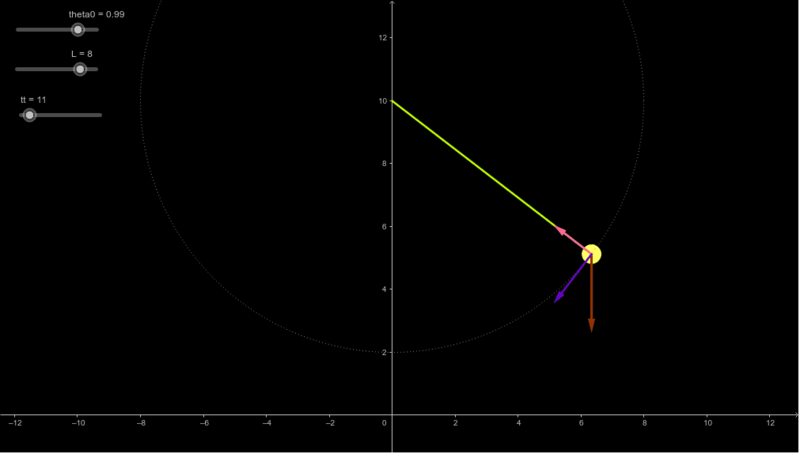 This is a simple pendulum simulation, using a linearized equation of motion. The objective here is to show how the forces acting on the pendulum bob vary during the movement. For larger initial angle displacements the motion used here is not realistic; see the other PendulumMotion activity for a better representation of the actual motion. The rod holding the pendulum bob is assumed to be rigid (i.e., not like a rope or string) and massless. To use this graphic, first set the time slider to zero, then set the desired pendulum length and initial angle (radians). Then either press the space bar for full-speed motion, or use control-arrow to do a slower motion. Observe how the three vectors vary. Note how the bob's net-force vector is only aimed at the equilibrium position when the initial angle is small; this is one condition for simple harmonic motion (SHM), that the "restoring force" varies linearly with displacement from the equilibrium position, and is always directed toward it. Again, we are using the SHM solution here, even when it does not apply- this is the case when the net-force vector does not point toward the equilibrium position (i.e., the bottom of the circle). This non-SHM behavior happens for initial angles larger than a few degrees.